Continuing to fill out, your baby now weighs about 680g and is approximately 35cm in length from crown to heel. All the internal organs are continuing to develop and the lungs are gearing up for the development of air sacs lined with capillaries, which will eventually enable them to breathe in air. The nostrils are also beginning to open, to allow the baby to take those all important 'practice breaths'. 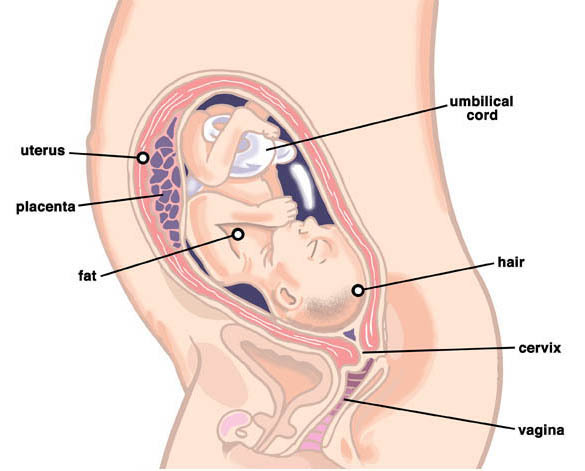 This development takes time and they will not actually be able to breathe air outside the womb (unaided) just yet. You should still be enjoying the 'honeymoon' trimester, with having more energy and not too much discomfort, but that is not to say that the middle stage of pregnancy is without common problems. While it is true that many women feel less lethargic during this stage, some women are still very tired simply because they are struggling to sleep. Make sure that you are doing all you can to give yourself a good chance of a solid rest at night. Ensure that you have enough pillows or cushions to get comfortable; make sure that you avoid stimulating food and drink before bedtime (such as those containing caffeine), and make sure that you hit the sack at a decent hour. Another common, unwanted side effect of pregnancy at this stage is stretch marks. Nearly all pregnant women get them so don't feel that you are alone if you have noticed them. They are most common on your tummy, breasts and thighs. They will be brown or reddish in colour, although after pregnancy this pigment will go and the marks will probably be left lighter than your natural skin colour. There is very little evidence that the use of creams prevents stretch marks. However, they are potentially minimised with regular application of oils or creams containing vitamin E. They may also be helped by ensuring that your diet is rich in vitamin E (found in nuts, seeds, spinach and broccoli), vitamin C (found in citrus fruit, strawberries, tomatoes and broccoli), zinc (found in red meat, poultry, and fortified breakfast cereals) and silica (found in oats and rice). You should have another routine antenatal appointment around this time. If you are unsure whether this has been arranged then contact your surgery. At this appointment your midwife will check the size of the uterus, listen to the baby's heart beat and check your urine for protein. Make sure that you are still following a healthy and varied diet. Remember that smoking when pregnant can be seriously harmful to the health of your baby, but that doesn't just mean giving up yourself. It means steering clear of people who smoke, and imposing a strict ban on smoking in your home. Advice on drinking alcohol while you are pregnant can be more confusing. There are studies that show a clear correlation between drinking heavily during pregnancy and the risk of long term health and behavioural problems for your child. The official advice in the UK is to abstain from alcohol throughout your pregnancy, yet you are sure to have had plenty of other mothers (possibly your own) telling you that they had a glass of wine most nights of their pregnancy and that their baby turned out to be very healthy. That may well be the case, but the fact is, there is not enough evidence to conclude that light drinking causes zero harm to your unborn baby, and while all we have are inconclusive studies, it is better to err on the side of caution rather than to take any unnecessary risks. Page generated in 1.3725 seconds.